2 ART NOUVEAU WALL ANEROID BAROMETER: Circa 1920's with Art Nouveau style and decoration. Aneroid barometer with silvered face. Measures 24 1/2'' x 19'' x 4 1/2''. 3 FRENCH FIGURAL MERCURY CLOCK: Mixed metal brass and bronze with gilded figure of Mercury and staff on top. Metal mace with Roman numerals. French time and strike movement marked AB 156. Key and pendulum in office. 20'' h. x 13 1/4'' x 6''. From the collection of Banana George Blair. 4 LECORNEY, Nicolas, (European, 19th/20th C): Girl Blowing Kiss, Bronze, 11''h, incised signature. 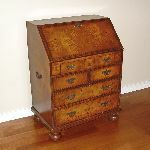 7A FRENCH STYLE MARBLE TOP SECRETARY ABATTANT: What appears to be a lingerie chest can also function as a secretary. 4 drawers with 3 false front drawers falling to expose the series of drawers. Matchbook diamond pattern veneer on drawers and sides. Carved half column front. Variegated inset marble top. 57 1/2'' h. x 34'' x 16 3/4''. 8 FREMIET, Emmanuel, (French, 1824-1910): Satyr Teasing Two Bear Cubs, 10''h x 21''w x6''d, incised signature, impressed illegible foundry? mark. 10 GUERARD, Eugene, (French, 1811-1901): Panoramic Italianate Landscape with Figures, signed and dated 1844, Dussel.d., OIL/Canvas/Mounted on Masonite, 24 1/2'' x 34 1/4'', later gilded gesso frame, 30 1/2'' x 40 1/4''. Guerard was born in Austria, his father was a miniaturist and court painter to the Emporer. He eventually moved in Rome, where he was involved with the Nazarenes. Guerard studied in Dusseldorf, moved to Australia, and after an unsuccessful stint as a gold digger, he became recognized as the foremost landscape artist in the colonies. Guerard is most known for the wilderness paintings produced during this time, which are remarkable for their detail. His View of Tower Hill in South Western Victoria was used as a botanical template over a century later when the land, which had been laid waste and polluted by agriculture, was systematically reclaimed, forested with native flora and made a state park. The scientific accuracy of such work has led to a reassessment of Guerard's approach to wilderness painting, and historians believe it likely that the artist was strongly influenced by the environmental theories of the leading scientist Alexander von Humboldt. In 1866 his ''Valley of the Mitta Mitta'' was presented to the national gallery at Melbourne; in 1870 the trustees purchased his ''Mount Kosciusko''. In 1870 von Guerard was appointed the first Master of the School of Painting at the National Gallery of Victoria, where he was to influence the training of artists for the next 11 years. 19 DeJONGHE, Gustave Leonhard, (Belgium, 1829-1893), : ''Kind Heart'', Oil on Canvas, depicts the kindness of a child with her mother giving money to a young, less fortunate mother cradling her infant, signed LL, Gustave DeJonghe, 34'' x 25 1/4'', gilded frame with overpaint and in need of maintenance, 44'' x 33''. 20 OIL/CANVAS EARLY PAINTING AFTER VELASQUEZ? 17TH? CENTURY: 45'' x 39 3/4'', unframed, depicts and elderly man and woman eating dinner at the table with pet cat, 18th/perhaps 17th C. canvas, old stretcher is in need of repair. 23 TIFFANY FURNACES FAVRILE GILT BOX: With inset enamel leaves and flowers decoration on hinged lid. Cedar lined interior. Marked Louis C. Tiffany Furnaces Inc, Favrile 139. Measures 2'' x 6 1/4'' x 3 3/4''. 24 IFFLAND, Franz, (German, 1885-1915): 18 3/4''h, incised signature, Kraas foundry mark, sculpture depicts Mercury seated holding staff in his right hand while wearing his winged helmet. From the collection of Banana George Blair. 25 PIGALLE, Jean Baptist, (after)(French, 1714-1785): Mercury Attaching Wings to His Ankles, Bronze, 23'' h., incised signature, good late 19th C casting. From the collection of Banana George Blair. 25A GREEN MARBLE PEDESTAL: Ribbed central column with turned step down base and removable top. 39 1/2'' h. x 12'' dia. From the collection of Banana George Blair. 26 EARLY 20TH CENTURY BRONZE OF MERCURY SEATED ATTACHING WINGS TO HIS ANKLES: Appears to be a French bronze casting, illegible impressed signature, one visible mark from the Louvre, 22 1/2''h. From the collection of Banana George Blair. 30 MORRISH, Stanley, (British,): ''The Letter'', Young Woman Seated at a Desk Reading a Love Letter, OIL/Canvas, 20'' x 16'', signed lower left, dated 1873, later gilded and pierce-carved gesso frame with minor wear, 26 1/2'' x 22 1/2''. 32 LARGE MERCURY MARBLE: Seated Mercury with Sword and Pan Flute, 19th C Marble, 30 1/2''h, no visible signature. From the collection of Banana George Blair. 37 GLADENBECK STUDIO MERCURY BRONZE AFTER GIAMBOLOGNA: Approximately 32''h, 39 1/2''h with variegated green marble plinth, incised signature, circa 1900. From the collection of Banana George Blair. 38 LATE 19TH/EARLY 20TH CENTURY BRONZE OF MERCURY AFTER GIAMBOLOGNA: 22''h, 31 1/4''h overall with white marble plinth, overall width 10'', no visible signature, appears to be a grand tour souvenir. From the collection of Banana George Blair. 44 19th C. MARITIME SHIP FIRE PAINTING: Oil/Canvas, 19'' x 27 1/8'', inscribed on the bottom, ''Burning of the Ship W.J. Lewis of Halifax, New Brunswick, Capt. Dodd From Buenos Ayres to Antwerp with Wool, Lat 30 N., Long 35 W, March 1878, Crew Saved by the Titania, Liverpool Capt J. Baron. 46 DALI, Salvador, (French/Spanish, 1904-1989): Mercury, Etching, 30'' x 22'', pencil signed, numbered 47/50, line stamp lower right, metal frame, 31'' x 23''. From the collection of Banana George Blair. From the collection of Banana George Blair. 47 CARVED MARBLE FIREPLACE MANTLE AND SURROUND: Serpentine front with carved decoration, carved fluted surround. 43 1/8'' h. x 51'' x 12 3/4''. 48 19TH CENTURY GENRE SCENE WITH YOUNG CHILD AND PET BIRD: OIL/Canvas, 27'' x 22'', no visible signature, worn painted frame, 31'' x 26''.